ST. PETERSBURG, Fla. – Temple quarterback Frank Nutile wasn't flashy but efficient. It was symbolic of his time as a starting quarterback, with him steadying what had been an inconsistent offense. 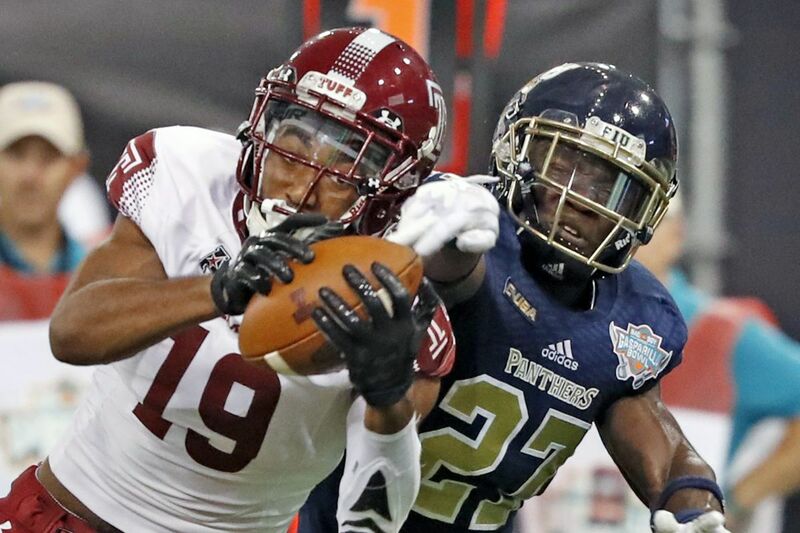 Making his sixth career start, all in a row, Nutile ran for one touchdown and threw for another as Temple defeated Florida International University, 28-3 in Thursday's Gasparilla Bowl at Tropicana Field. Temple, which went 4-2 with Nutile as a starter, ended the season 7-6. The senior class ended with 33 wins, most in school history. FIU finished 8-5. "We talked about winning one for our seniors," said Nutile, a redshirt junior, after the game. Nutile, who earned his first start in the eighth game due to an injury to Logan Marchi, completed 18 of 28 passes for 254 yards, one touchdown, and no interceptions and was named the game's MVP. "When the o-line blocks like that and the receivers get open it is kind of easy, I am just going through my reads," Nutile said. "And coach P [offensive coordinator Dave Patenaude] did a great job calling plays. It was a group effort." Entering the game, all the attention went to Nutile's counterpart, FIU senior quarterback Alex McGough. The game changed drastically in FIU's first offensive series, when McGough fractured his collarbone after running 17 yards for a first down. A righthander, McGough stayed in the game for two handoffs before leaving for good. Sophomore Maurice Alexander, who had attempted six passes all season, replaced McGough. Earlier this week, FIU coach Butch Davis said McGough was a definite NFL prospect and that he would be surprised if the 6-foot-3, 218-pound senior was not drafted. McGough is FIU's all-time leader in career touchdown passes (66) and second with 9,091 passing yards, including the seven he got in his only pass attempt against Temple. 'Without him, it wasn't surprising that the Panthers struggled to move the ball. Davis also had high praise both during the week and after the game for Nutile. "His insertion into the starting lineup made a dramatic difference in their season," Davis said. "Once he came in, he gave them some poise, some stability, he runs the offense extremely well and he makes the right decisions." Trailing 7-0, FIU scored its only points on a 27-yard field goal by Jose Borregales with 3 minutes and 12 seconds left in the third quarter. From Temple's perspective, it could have been worse. On the play before, FIU had a third-and-5 from the Owls 10 when running back Napoleon Maxwell dropped a pass in the left flat that easily could have resulted in a touchdown. On the next series, Temple used the passing game to take a 14-3 lead. Faced with a first-and-30 on its own 30, Nutile completed passes of 13 yards to Keith Kirkwood, 17 to Isaiah Wright, and 39 yards to Adonis Jennings, who made a spectacular catch on the 1-yard line. On the play, FIU's Brad Muhammad was called for pass interference, but Jennings was somehow able to catch the ball while on the ground and hold onto it. "We practice on-the-body-type catches in practice and I credit that (receivers) coach (Stan) Hixon and coach (Geoff) Collins," Jennings said. "Just our receiver group doing that day in and day out, and practicing and when the time came, I made a play." David Hood then scored on a 1-yard run, but the play was overruled. In this game, there were far more plays reviewed then there were scoring plays. On the next play, Hood scored from 1-yard out. FIU thought he had fumbled, but the officials said he crossed the goal line before fumbling with 28 seconds left in the third quarter. The Owls extended the lead to 21-3 when Nutile hit Isaiah Wright on a 45-yard scoring pass with 7:26 left. Wright caught the slant at the 35 and dashed to the end zone for his fourth touchdown reception. Ryquell Armstead would later add a 5-yard touchdown run. Temple opened the scoring on a 4-yard run by Nutile with 11 minutes, 45 seconds left in the first half. That completed a 7-play, 68-yard drive, with the big play a 23-yard catch and run by Keith Kirkwood. On the first play of the next series, an interception by Temple linebacker Shaun Bradley gave the Owls the ball at the FIU 45-yard-line. Coupled with an earlier pick by Owls safety Sean Chandler, it was the first time this season Temple has intercepted more than one pass in a game. The Owls led 7-0 at halftime and held FIU to 42 passing yards. Temple sophomore linebacker William Kwenkeu, who entered the game with one tackle for loss and no sacks, had two sacks among his six solo tackles. This game came a day after Kwenkeu, who was born in Cameroon, passed his test to earn his American citizenship. He will be officially sworn in on Wednesday. When the Owls recorded their seventh sack late in the game, they broke the Gasparilla Bowl record of six set by Rutgers. It was a strong effort by both sides of the ball. When Temple was 3-5, qualifying for a bowl seemed iffy, but the Owls kept fighting. "These players work so hard," Collins said. "They've done an amazing job. The future is bright at Temple football."